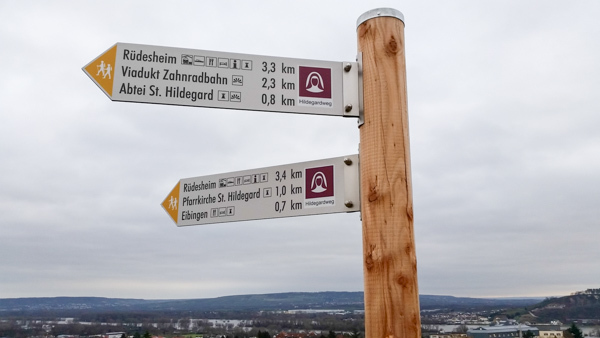 On the way with Hildegard. Saint Hildegard of Bingen (1098-1179) was recently declared a Doctor of the Church by Pope Benedict. She had a broad knowledge of the Bible, theology, philosophy and natural history. Her rich knowledge of the church fathers and the desert fathers of Egypt were an inexhaustible source of inspiration and formed the basis of her work. God granted her visions which she set down in the book called the Scivias. 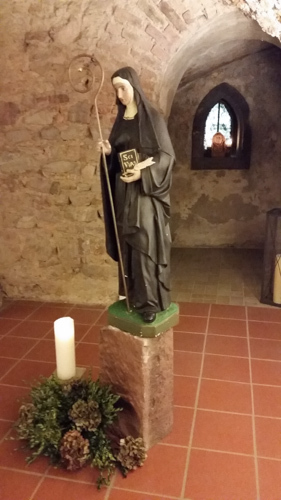 So, inspired by this saint, I set about exploring her life in Bingen. 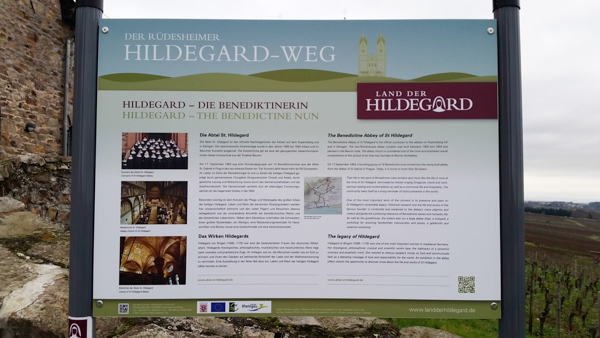 Just as Saint Hildegard held the people of her day spellbound so too I am held spellbound by her as I walk the streets of Bingen and reconstruct in my mind her life. 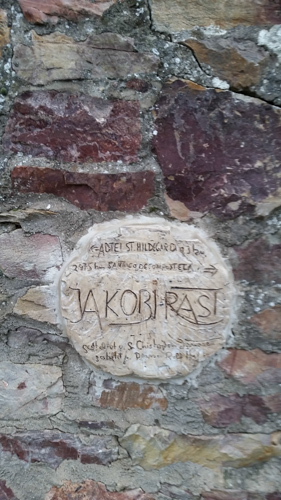 At age 14 she she was given over to Jutta of Sponheim to receive an education. 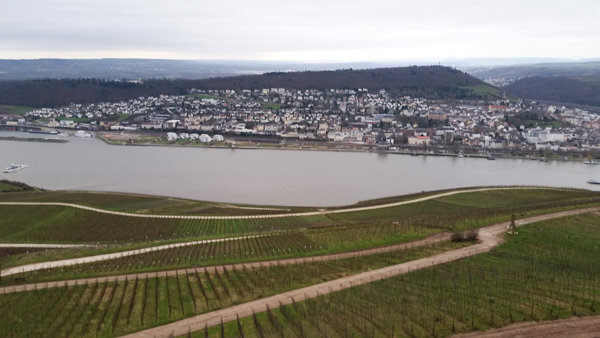 After a long and bitter dispute in Disibodenberg in 1150 she moved her abbey to Rupertsberg which is accross the river Nahe from Bingen. 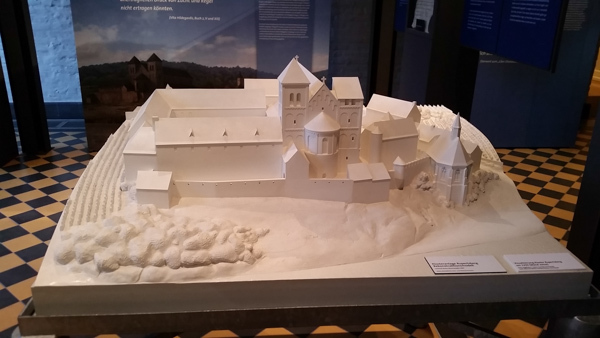 The Abbey was destroyed by the Swedes in the 30 years war. Here is a model. Although little remains today of the abbey there are some excavations so you can stand under her monastery church. 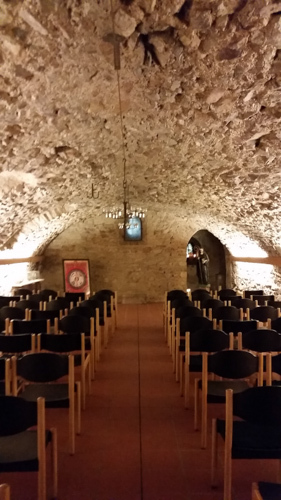 When the abbey was destroyed by the Swedish Protestants the sisters escaped with her relics which are today housed in the church of Eibingen. 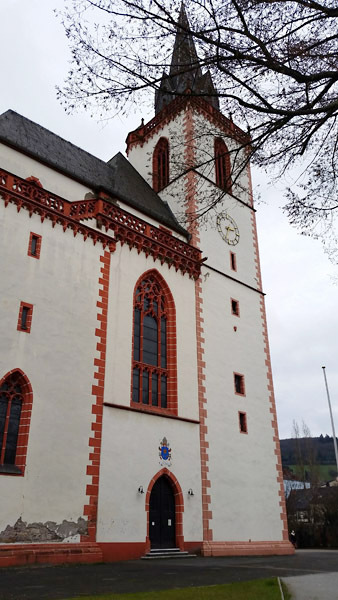 The second monastery Saint Hildegard established in Eibingen across from the first monastery in Bingen. 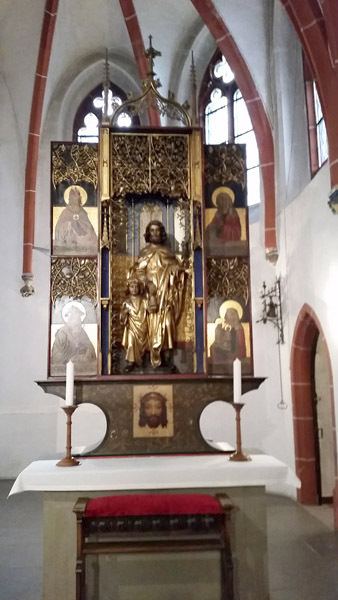 This was destroyed in the bombings but rebuilt (and houses her relics). 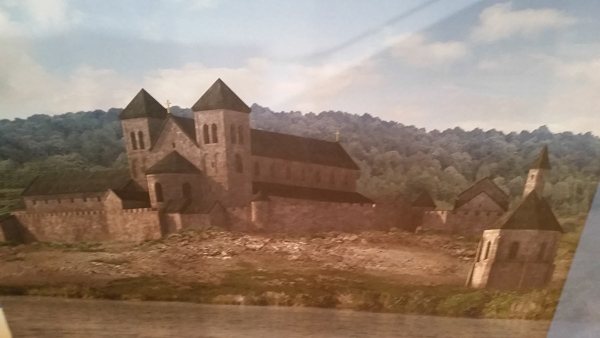 In 1165 she moved across the Rhine river and resettled the monastery of Eibingen. 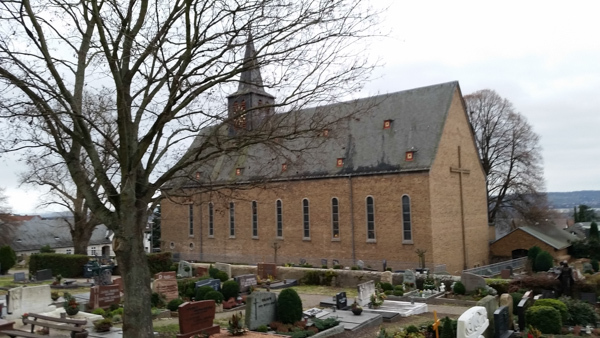 Today the parish church remains. 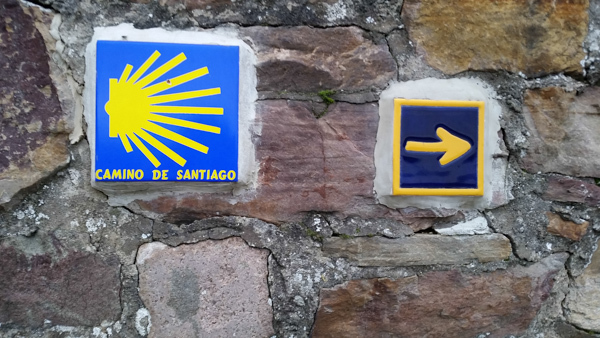 Monastery of Saint Hildegard built in 1904. 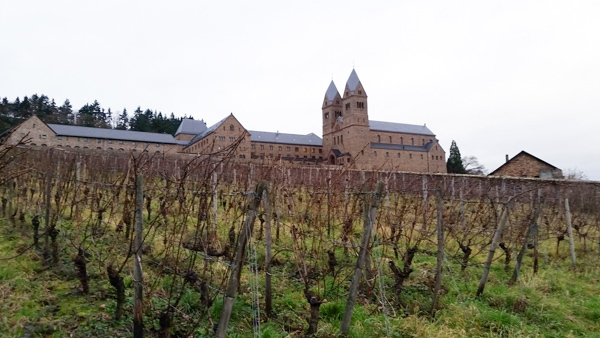 It is a very active benedictine monastery. They are lovely and observe the office in Latin chant. In 1803 the convent at Eibingen was disolved in the course of secularization. 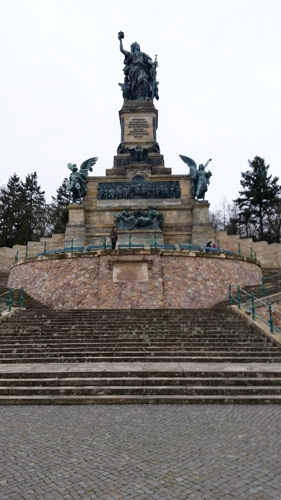 Bishop Blum was driven from his office by the Prussian State and given refuge by Prince Karl in Bohemia. 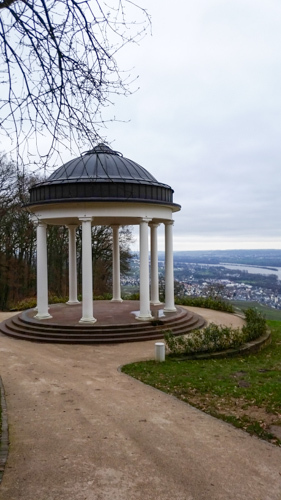 His successor worked with the Prince to revive the old convent in Eibingen. 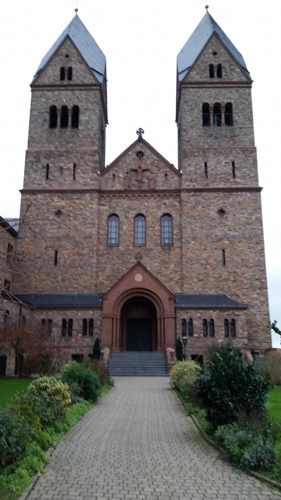 And he built the new convent so in 1904 moved from Prague and in 1908 the abbey was vested with all the privileges of the former Abbey of Hildegard. 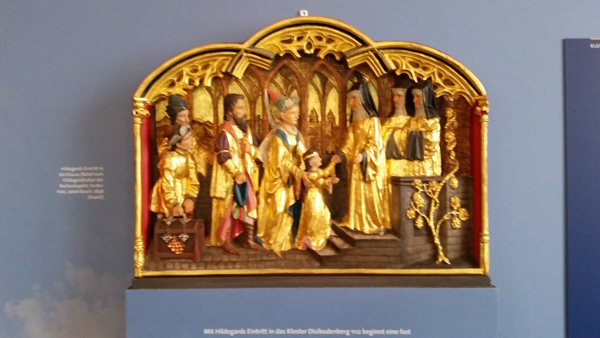 So thanks to the efforts of Prince Karl the monastic tradition of Saint Hildegard flourishes where it all begin. 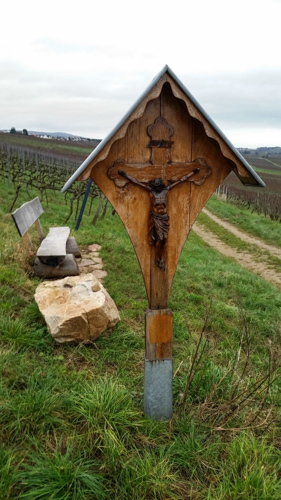 Spending these days walking through the streets in Bingen and Rudesheim and through the surrounding countryside was a moment where I felt the presence of this holy woman who had such a passionate love for God and the world he created. 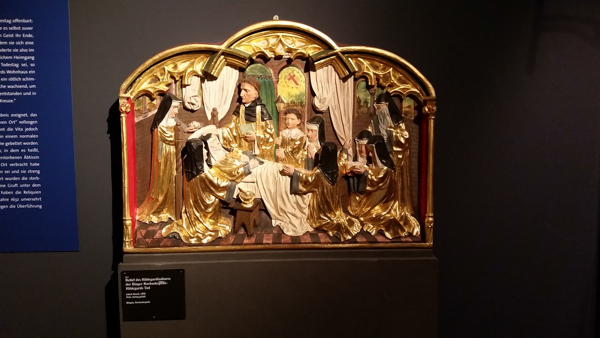 A relief (color) of Hildegard dying. 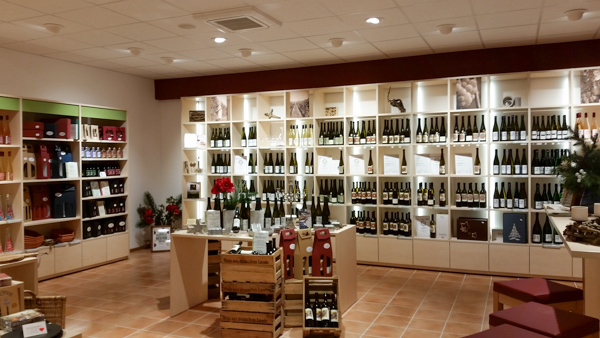 The sisters work their vineyards and sell their wine along with religious goods. 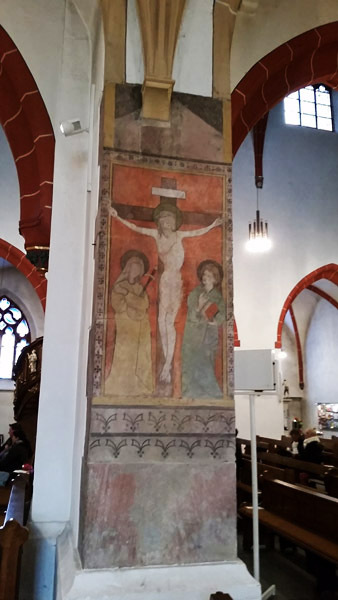 This entry was posted in Europe, Saints and tagged Bingen, Hildegard, saints on January 12, 2015 by frjfkauffmann. 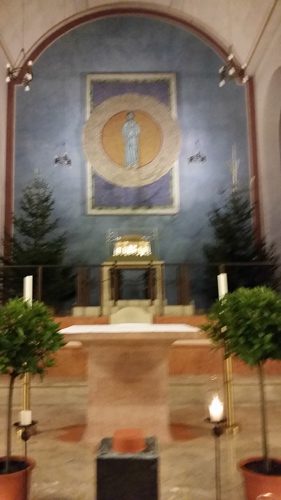 Last night was thrilling as I stood at the altar of St. Martin Basilica, concelebrating Christmas Eve Mass in Bingen, the home of St. Hildegard. At the beginning of Mass we processed to the Christmas crib for the blessing which was very moving. 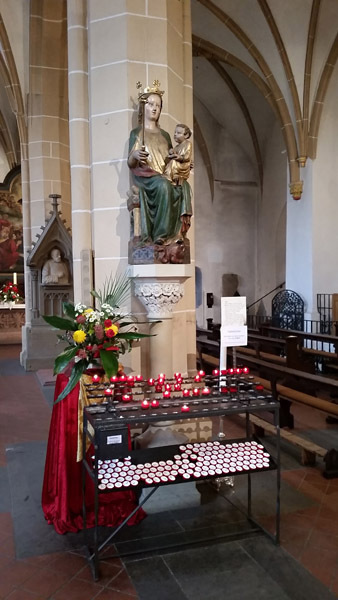 The church was illluminated with candles and the singing was vigorous. At the crib memories of all the Christmas cribs at the parishes where I have been assigned were very vivid. 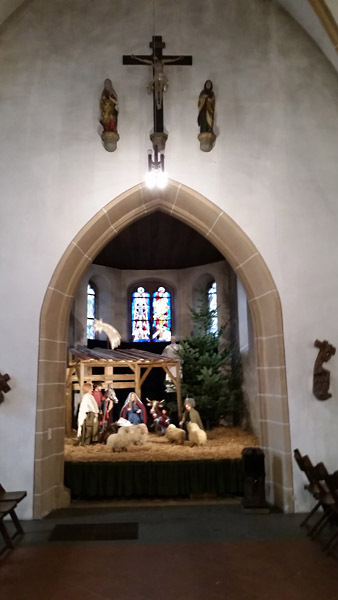 For almost 40 years preparing the crib with devoted parishioners has been a highlight for me. Then at the altar I remembered in prayer all Christ’s faithful I have been priviledged to serve. Saint Augustine in Richmond, Saint John in Waynesboro, Saint Mary of the Annunciation, Saint Benedict in Richmond. The solemn celebration last night was a moment of thanksgiving for all the faithful people entrusted to my care. 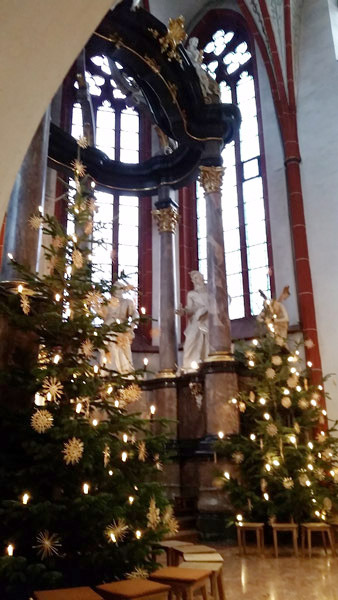 During the Mass I prayed through the intercession of Saint Hildegard of Bingen to bless all those with whom I have celebrated this most holy night throughout my priestly ministry. As those beautiful words of the Christmas proclamation drifted through the air so heavily laden with incense my thoughts turned to all those entrusted to my care in ministry and I prayed the Christ child be born anew within their hearts on this most holy night. 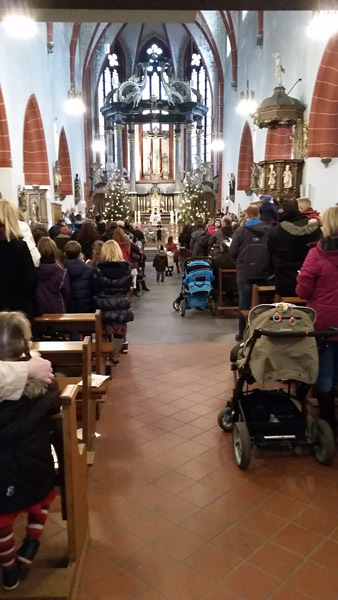 This morning we returned to church for the Solemn Mass of Christmas Day. There was a men’s Gregorian choir and mixed choir. It was stunning. The men chanted the propers in latin and the mixed choir augumented the singing and also prepared some choral selections. The high point was the chanting the Creed in Latin which so beautifully unites us in a faith that transcends language and culture. 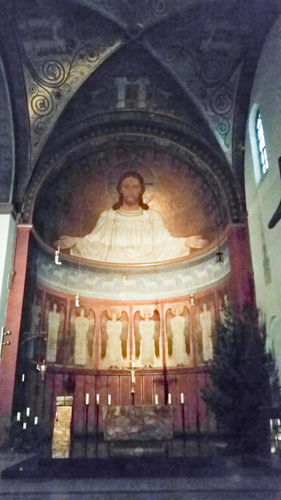 At the altar I felt so close to everyone in the church and when I distributed Holy Communion with the invitation, “Der leib Christi,” the body of Christ, I was so drawn into the mystery of the Incarnation. 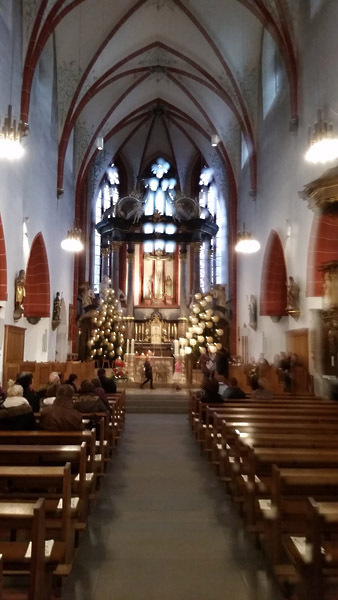 This entry was posted in Beauty, Europe, Feasts and tagged Bingen, Christmas, Germany, Hildegard, Mass on December 25, 2014 by frjfkauffmann.